As the sun rose over Byron P. Hollett Little Giant Stadium Saturday morning, throngs of people arrived on the campus of Wabash College. Many were bringing their children to the stadium for a day of competition in the Crawfordsville Youth Football League. 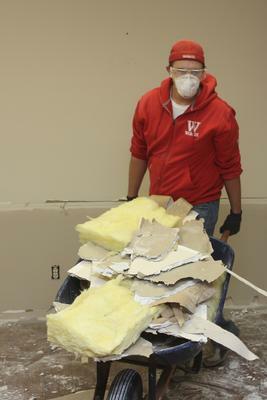 But the more than 150 Wabash students, alumni, staff, and faculty who arrived at the stadium were focused on service to others through their participation in the Eighth Annual WABASH Day — the College’s national day of community service. 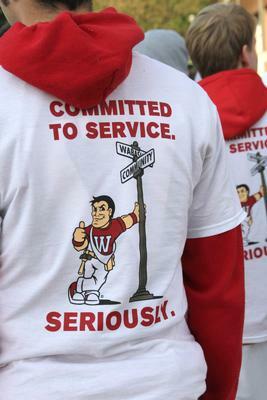 WABASH Day (Wabash Alumni Benefitting And Serving Humanity) began in 2005 and has grown in popularity over the years. 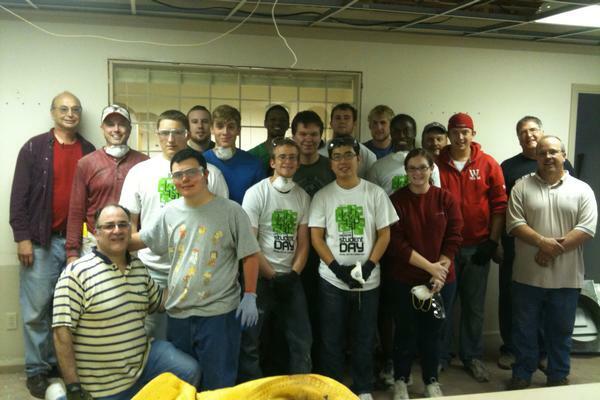 Over 30 alumni groups from coast-to-coast take part in community service projects in their local communities. Check the "Related Links" in column at right for reports and photos from across the country. Be sure to check back because it will take a couple of days to get all the reports onto the website! 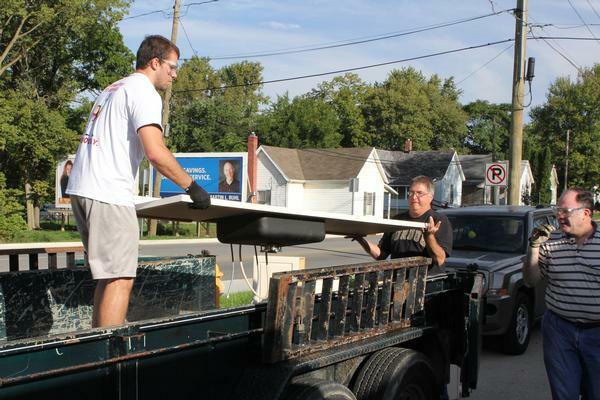 This year, however, organizers made a concerted effort to involve more Wabash students — and the effort paid off. 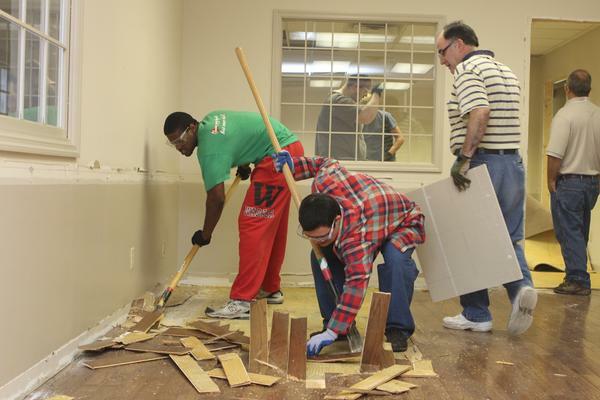 Large numbers of Wabash students accompanied alumni and community leaders in a dozen projects across the city of Crawfordsville. 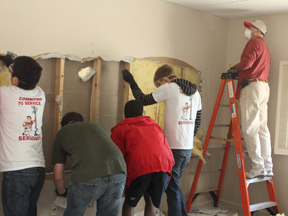 Alumnus Herm Haffner organized the activities and led a team of students from Tau Kappa Epsilon at the Habitat for Humanity site. 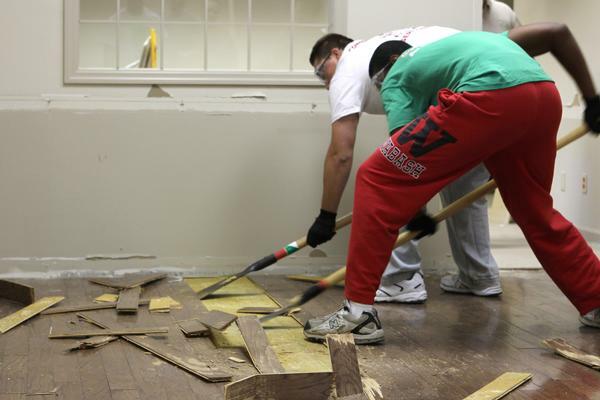 Highlighting the Crawfordsville projects was work at the site of the Montgomery County Free Clinic, where men from Kappa Sigma fraternity worked with Free Clinic board members to demolish the inside of the old Main Source Bank in anticipation of renovation that will turn the building into a public health clinic to serve the uninsured. The clinic, named after Dr. Mary Ludwig, is a terrific example of collaboration between Wabash College, local health care professionals, and community leaders. 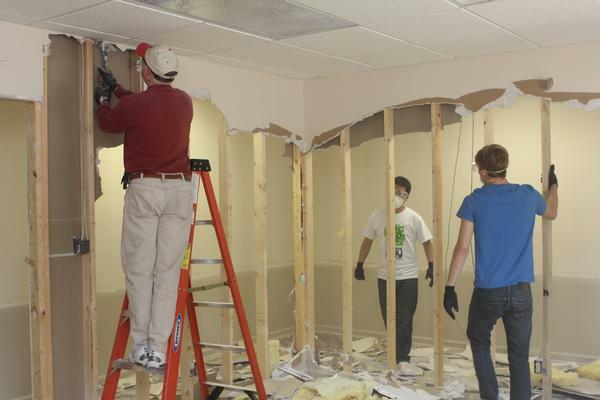 Free Clinic President Bill Doemel, emeritus professor of biology, spearheaded the project, which involved students removing drywall, ceiling tiles, hardwood flooring, and carpeting. The work was hard and the conditions difficult. 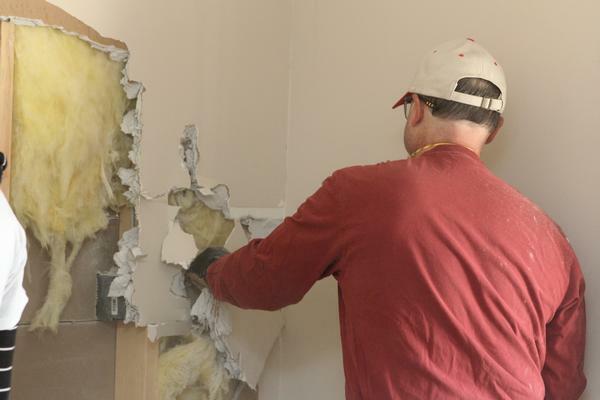 As the drywall came tumbling down, dust filled the air. 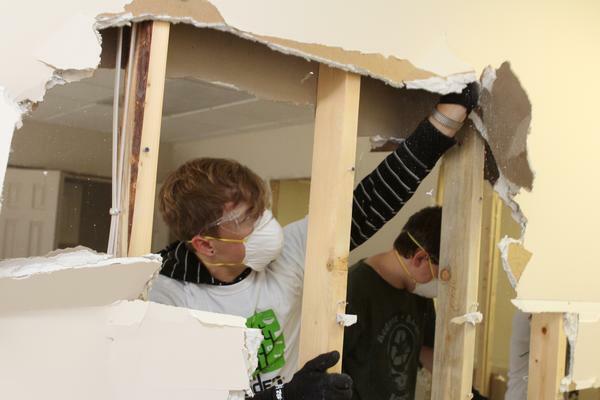 Students, armed with crowbars and shovels, attacked the project as if they were taking out frustration from the first few weeks of classes. Alumnus, MCFC board member, and local physician John Roberts modeled for the students the kind of hard work it takes to sustain this community. He spent the morning with a respirator over his mouth and nose, while standing on a ladder hacking through drywall and removing nails. 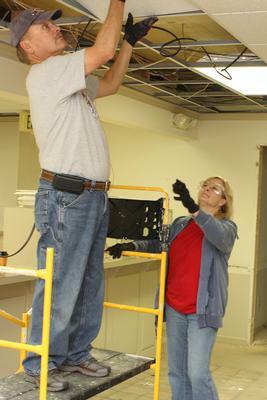 Board members Paul Pfledderer and Chris Amidon led students in carefully removing ceiling tiles so that they could be repurposed in the new building. 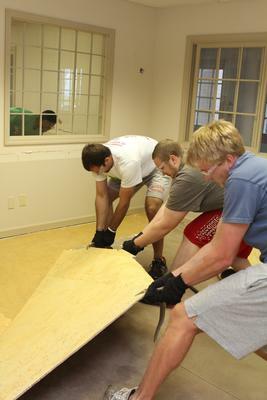 Award-winning chemistry major Edward Evans, a Wabash senior, worked with a dozen fraternity brothers, including group leader Jacob Sheridan, to remove over one thousand square feet of glued-down hardwood flooring and carpeting. 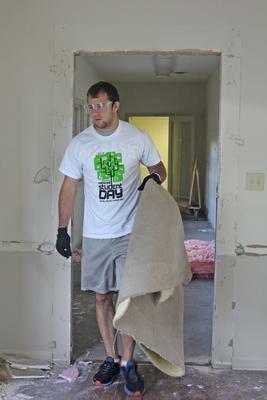 Meanwhile, downtown, Mayor Todd Barton, a Wabash alumnus, led men from Phi Kappa Psi, Phi Delta Theta, and Phi Gamma Delta in work around the old Ben Hur Building. 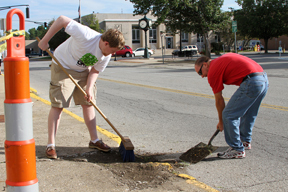 Mayor Barton had them sprucing up the sidewalks and exterior of the building, which has been unoccupied for years. The mayor continues to seek development opportunities for the historic building, and after Saturday morning, the area all around it looked much better. 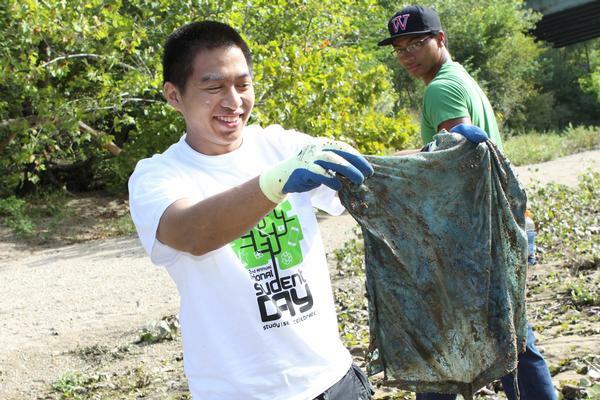 Honorary alumnus Steve Charles led a group of international students and fraternity men that started at the Sugar Creek Nature Park and cleaned up the banks of the creek. Across the highway, members of Sigma Chi were working at Elston Softball Park. Alumnus Craig Green, Class of 1959, led freshmen from Phi Gamma Delta in a series of projects at the Vanity Theater. Some hung banners, others worked in the wood shop, and still others painted the set for the forthcoming production of Noises Off. Art Professor Doug Calisch took some Phi Kappa Psi brothers to the Wabash Community Garden, where they harvested and weeded. Fourteen members of the Wabash track team, with help from Coach Clyde Morgan and alumni Chris Ervin and Chip Timmons, managed the Crawfordsville Youth Football League games. 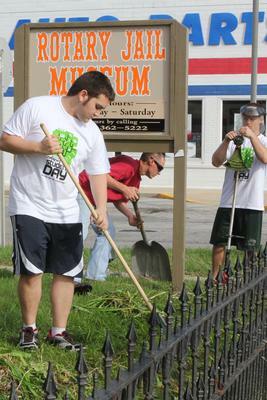 Alumnus Sam Smith and political science professor Shamira Gelbman had a big crew working at the Old Jail Museum. They cleaned up around the outside and polished up the cells inside. 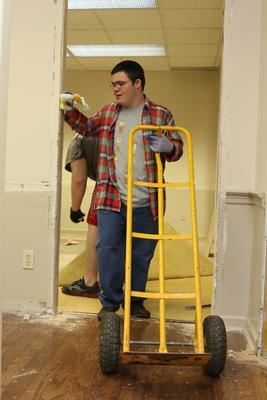 More than a dozen members of Theta Delta Chi helped clean up the Sportsman’s Club and spent time at the Animal Welfare League. 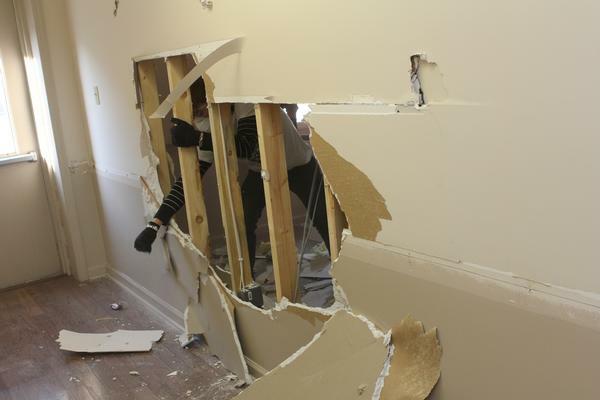 The work the Theta Delts did at the Sportsman's Club was both difficult and time consuming, and helped the Club prepare for its annual Halloween Haunted House. Alumnus Brad Mullendore led a group working at the Lew Wallace Study. 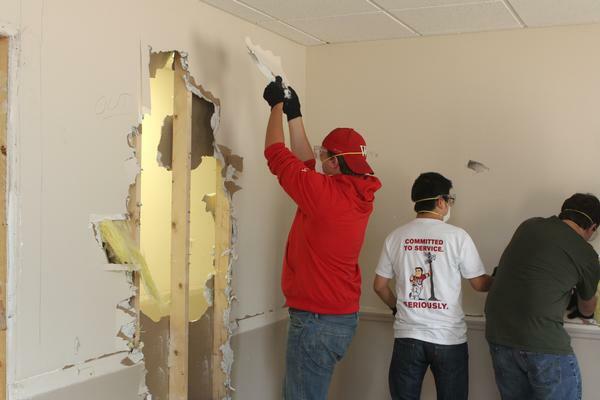 By involving 150 Wabash students this year — and focusing their efforts on the city they call home during their time on campus — WABASH Day took a giant leap forward. 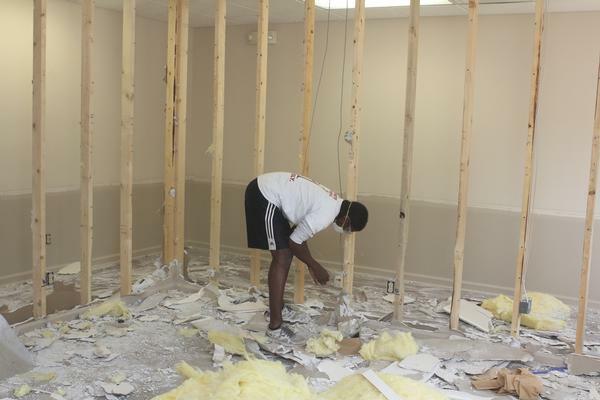 The students got to see the community differently, and provide real work and service to organizations and agencies that really needed their help.